The author of many bright, cheerful paintings, B. M. Kustodiev, during his creative life, created more than a dozen paintings devoted to his family: his wife, Julia Evstafevna, and children, the older Kirill and the younger Irisha. Love and family happiness are clearly guessed in bright, colorful, aerial works. The first portrait of Irina’s little daughter, 1905, was made in the form of a pencil drawing and as the artist’s notes indicate, after four hours from the moment of her birth. A charming smile glows on an infant clear face. Simple and lively drawing marked the beginning of a whole gallery of wonderful canvases. Irina Kustodiyeva can be called a favorite and the best model of the artist. He wrote it in the hands of his wife, in the family circle at the table, he captured her first steps; Irina with fruits, flowers, animals and dolls is always beautiful, ruddy, healthy and elegantly dressed. “Girl with apples” – the work of 1918. To her, the Russian artist made a postscript: “Portrait of Irina Kustodiyeva.” This canvas shows a portrait of his daughter in profile. A bowl in the hands of a thirteen-year-old girl goes beyond the border of the painting The viewer can see several fruits of ripe yellow apples with a blush. The girl’s face is childlike, pretty, long, golden hair is tucked behind her shoulders with a lush orange bow. The dark blue dress does not attract attention, as the background of the portrait, made in dark brown tones. The model’s gaze, focused and serious, betrays a young girl already in her, gentle and thoughtful. “Girl with apples” made in the style of realism. Thick layers of oil paint thicken on the canvas in shaded areas. 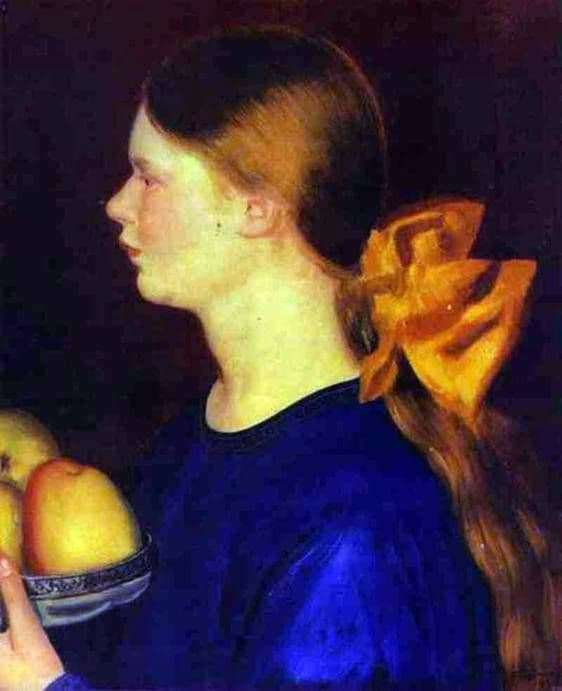 Glare of light smoothly falls on the face, hair, dress of Ira and the fruit in her hands, forcing the picture to come to life and reliably tell the audience about the life of his beloved daughter of a beautiful Russian artist.